This book offers a detailed examination of the counter-insurgency operations undertaken by the Nigerian military against Boko Haram between 2011 and 2017. 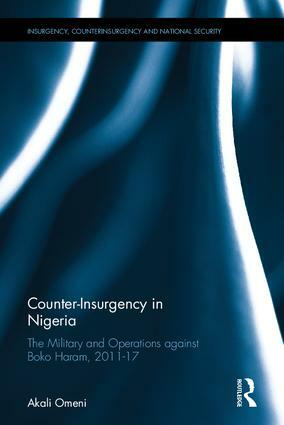 Based on extensive fieldwork conducted with military units in Nigeria, Counter-Insurgency in Nigeria has two main aims. First, it seeks to provide an understanding of the Nigerian military’s internal role – a role that today, as a result of internal threats, pivots towards counter-insurgency. The book illustrates how organizational culture, historical experience, institutions, and doctrine, are critical to understanding the Nigerian military and its attitudes and actions against the threat of civil disobedience, today and in the past. The second aim of the book is to examine the Nigerian military campaign against Boko Haram insurgents – specifically, plans and operations between June 2011 and April 2017. Within this second theme, emphasis is placed on the idea of battlefield innovation and the reorganization within the Nigerian military since 2013, as the Nigerian Army and Air Force recalibrated themselves for COIN warfare. A certain mystique has surrounded the technicalities of COIN operations by the Army against Boko Haram, and this book aims to disperse that veil of secrecy. Furthermore, the work’s analysis of the air force’s role in counter-insurgency is unprecedented within the literature on military warfare in Nigeria. This book will be of great interest to students of military studies, counter-insurgency, counter-terrorism, African politics and security studies in general. Akali Omeni has a PhD in Defence Studies from Kings College, London.